“I never thought the library would be at an event like THIS!” said one person who stopped by our CCLD teen library table at the recent scream music iMatter Festival in Elmira. We laughed and said that you must “expect the unexpected” from the library, especially with awesome teens involved! Outdoor Movie in Riverfront Park (West Water Street) – Captain America: The Winter Soldier (for all ages) Fri. Sept 12 – Get settled in at 6:30 (kids craft available), movie starts at 7:30. Sponsored by Friends of CCLD and Outside the Box. Video Game Design (for ages 10-18); Registration required; fee paid at registration; $10 per class or $25 for all 3 sessions. Thursdays: Oct. 2, 9, 16 @ 6pm. Author Skype Party: with Michelle Knudsen & her new Teen book “Evil Librarian” – Wed, Oct. 15 @ 6:30pm. Night Circus Halloween Teen Ball: Fri. Oct. 24 @ 7pm. Spectacle, music, food, costume prizes. Theme is from the book: “Night circus” by Erin Morgenstern. Check it out @ the library! Sponsored by Friends of CCLD! Become part of the Unexpected: Join our TAG—teen advisory group! Call, email, or stop in & ask Teen librarian Doris Jean: metzgerd@stls.org; 607-733-8603. 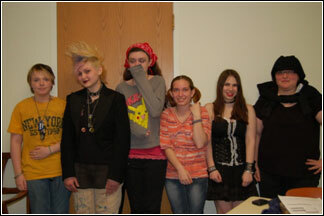 This entry was posted in Steele, Teen, Uncategorized by ccld. Bookmark the permalink.